According to the difference between 10 year nominal treasury bonds and TIPS (Treasury Inflation-Protected Securities) we were headed for a major, even catastrophic deflationary scenario. Although the jury is still officially ruminating, looking at the market price of copper, it seems that the massive monetary and fiscal measures taken by the US and other major countries around the world have removed much of the risk. The lower window pane in the above chart shows momentum or more specifically, the annual rate of change. When it drops below zero, the economy tends to sputter. Right now, copper momentum is still mired in the negative. And to bring it back to zero, copper futures have to, at least, recover to $325. Which is a very tall order. Obviously we aren’t there yet, but the rapid ascent which started late last year has already taken the industrial metal +50% from its low. So we if it continues in the same torrid pace, we’ll get there in no time. But no market is that simple, nor direct. 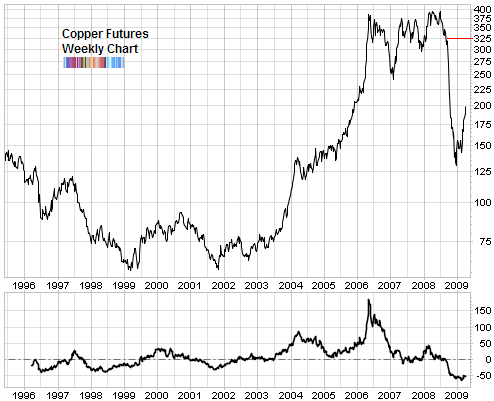 Copper futures have jolted higher so within a shorter term time span, it will need to work that out before continuing. But if we are truly in the first stages of a recovery, then copper is the commodity to watch. If the worst is actually over, then the price trend in copper will be the first to know. Way ahead of, and with much more accuracy than, any talking head on TV. if it should start back down, i’m sure someone in washington will suggest they put an uptick rule on shorting it.